Hey! My name is Adele and I live in the southern suburbs of Sydney with my fantastic partner and our three rambunctious sons (aged 8 and 4 year old identical twins). I design and create for my other baby, Three Beans in a Pod, who is about to turn 3. I just turned 32, but in my mind I’m about 25. I like coffee. A lot. I stay up way too late, which is probably why I like coffee. A lot. Or coffee is why I stay up too late? I’ve worked in the fashion retail industry for 15 years in various store level roles, taking a short break to study Primary school teaching (until I realised it wasn’t right for me). I still don’t know what I want to be when I grow up, but I’m happy being the me I am right now. I crochet items for children, adults and the home. Every one of my products starts with a ball of yarn and a hook. I use many different types of yarn from acrylic and cotton to merino wool, cashmere and silk. I use such a wide range of materials because I understand the benefits and limitations of each so I know what will best suit the uses of the product. I take inspiration from pretty much anything around me. The colours of nature and fine art, the structure of architecture and design, the craziness of my kids... Colour is probably my number 1 love, usually my creative process starts with colour combinations I want to work with, once I have that picture in my mind I can decide what exactly I want to create. This is usually when the pencil and sketch book comes out and I sketch what I’m making and write notes about how I think the pattern will work. Then it’s the fun part, yarn shopping! Forever. My first creations were probably mud sculptures left out on the fence to dry and ‘perfume’ made from flowers crushed into old juice bottles. I loved art at school, and studied photography back when there were dark rooms and chemicals involved. I wish I could say I learned to crochet sitting on my Nan’s knee when I was 5, but I didn’t catch the bug until I was pregnant with my first child. I discovered Pip Lincolne, bought her first book, youtubed and was hooked (pun intended) ever since. When I started out I only made children’s beanies, calling on my three children as my greatest inspiration. After a bit of a brainstorming session, Three (my three boys) Beans (as in beanies) in a Pod was born. Don’t ask me where the ‘Pod’ fits, just had a good ring to it. Maybe the ‘Pod’ is me, or the world around us? Who knows, we’ll leave that up to personal interpretation. I’m a visual person so I love Pinterest and Instagram. ‘Create and Thrive’ is a great blog for selling tips, and is Australian so very relevant to selling on Madeit. Ravelry is also a wealth of knowledge for any yarn based craft. Be genuine, be innovative, believe you can succeed and work hard to make it happen, be professional (but don’t forget to have a personality) and give great customer service. Focus on your plan, what do YOU want from YOUR business? Be an individual. You need to find your niche, your place in the marketplace. What makes you different to the person next to you? Chances are your brilliant idea has already been thought of, so you need to try and make it your own. How are you going to own it and give your customers something different? Try to develop a brand. Make it obvious when people come across you or one of your works they can relate it back to your store and your business. A brand isn’t just a logo. Think about who your customer is. Think about how you want your business to feel, what are you trying to portray? Fun and funky, classic and timeless? Make your decision and keep it consistent across your store, your blog or social media sites. Think of your online store as a retail, ‘bricks and mortar’ store. What are all the things you want to experience when you go shopping? How do you want to feel when you enter a store, what product knowledge and service do you expect from the sales assistant? Your photos are your window display and merchandising, your descriptions are your sales pitch and product knowledge. Just because people are shopping online doesn’t mean they don’t want and expect all of these things. And, most importantly, love what you do and have fun doing it! As a micro business there’s not a lot in the budget for advertising, but lots can be done with little or no cost. It is a must to have an online presence separate to your store, using social media. Facebook is still the most popular social media site and others such as Instagram or Twitter should also be utilised. Also forming relationships blogs who’s readership would be your target market, many have sidebar advertising available or may wish to feature your store or products. Utilising Madeit advertising is another low cost option. This has not really been learned the hard way (thankfully), but something I was unaware of when starting out was the legalities of selling products to the public, such as care and content labeling etc. These conditions apply to all products sold in Australia, even if it’s a micro or hobby business. So it’s best to do your research regarding the products you sell, better safe than sorry. I’m a ‘water body’ so I love swimming or just being close to a large body of water in any way possible is bliss to me. All of the family sleeping in until 9, taking the kids for a bushwalk followed by lunch by the sea. In the afternoon, a child free trip to an art gallery, then coming home to a cooked meal and a long (uninterrupted) bath. Oh, and no children bickering throughout! 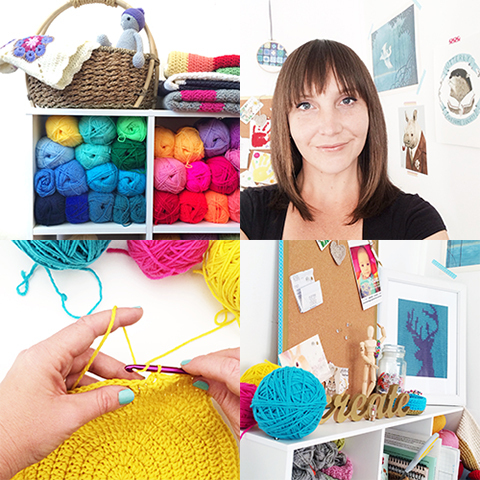 Monkey & Bee - Christine is so fun and has an uncanny knack at making everyday items exciting!